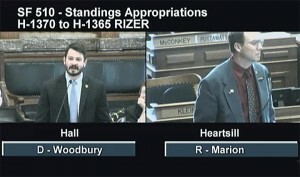 State Rep. Chris Hall (D-Sioux City) attacked state Rep. Greg Heartsill (R-Columbia) during debate on the standing appropriations bill last week after becoming aware that Heartsill was looking into concerns about the Governor’s Conference on LGBTQ Youth. Heartsill became concerned after learning some of the presentations made during the conference, which was sponsored by a number of taxpayer-supported entities, may not have been age appropriate. 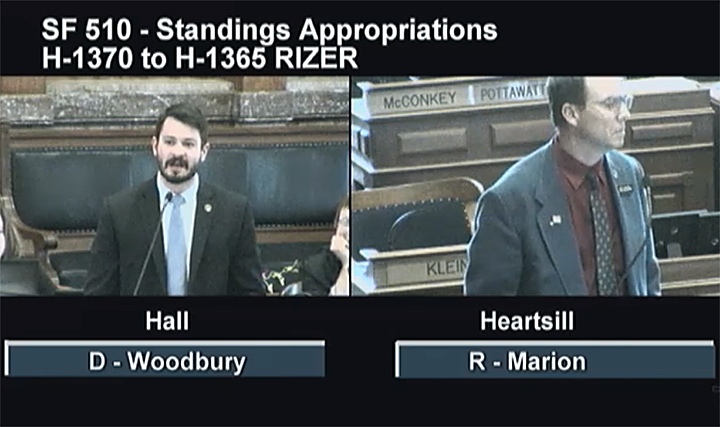 A state legislator, with support from a number of colleagues in both the Iowa House of Representatives and Iowa Senate, is looking into claims that material covered during the Governor’s Conference on LGBTQ Youth wasn’t age appropriate. This year’s conference was held Friday, April 3, at Prairie Meadows in Altoona. According to a number of reports on the event, the closing speaker used profanity throughout his presentation and encouraged students to engage in illegal activity – specifically, vandalism – against those who disagree with their views. Other claims, some of which were made public in a report posted from an observer on The Family Leader’s website, were part of a hour-long discussion on the View With a Pew radio program on 99.3 FM The Truth earlier this month. Scroll down to see video of the discussion. State Rep. Greg Heartsill (R-Columbia) began looking into this year’s conference after reading The Family Leader’s report. According to a letter submitted to Nate Monson, executive director of Iowa Safe Schools, a pro-LGBTQ group that sponsors the event, Heartsill had unsuccessfully requested unedited video recordings of the speakers, specifically those of Miss Coco Peru, Sam Killermann, and Ryan Sallans. We, the undersigned Iowa Legislators, respectfully request that you make available to us the complete un-edited video recordings of the recent Governor’s Conference on LGBTQ Youth that was held at Prairie Meadows in Altoona on April 3 of this year. News reports and comments from those who attended the conference suggest that some of the presentations were inappropriate for minor school children who were in attendance. In addition, we have been informed that organizations who depend upon public funds were sponsors of the conference. As members of the Iowa General Assembly, we have a responsibility to oversee the use of those funds and the organizations that are responsible for them. We understand that this request has already been made by Representatives Heartsill, but without a positive response from your office. We wish, therefore, to add our names to the list of Iowa Legislators that are interested in reviewing the conference presentations. Once again, please make available the un-edited video recordings of the conference including the presentations by Miss Coco Peru, Sam Killermann, and Ryan Sallans by no later than Tuesday, May 12, 2015. 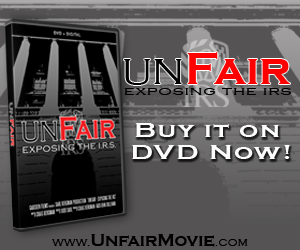 You may submit the recordings to Representative Greg Heartsill and we will arrange with him to review them. Thank you in advance for your prompt response to this request. According to the Iowa Safe Schools website, this year’s conference sponsors included School Administrators of Iowa, Iowa Association of School Boards, and the University of Iowa, all of which are funded, at least in part, through taxpayer money. State legislators have both the authority and responsibility to look into use or misuse of taxpayer funds. In response to the legislators’ letter, Monson sent a reply to the House and Senate leadership, which included Speaker of the House Kraig Paulsen (R-Hiawatha), Senate President Pam Jochum (D-Dubuque), House Majority Leader Linda Upmeyer (R-Clear Lake), Senate Majority Leader Mike Gronstal (D-Council Bluffs), House Minority Leader Mark Smith (D-Marshalltown), and Senate Minority Leader Bill Dix (R-Shell Rock). In the letter, Monson accuses the legislators, and Heartsill in particular, of intimidating Iowa Safe Schools, and he stated that video recordings of the conference do not exist. Iowa Safe Schools recently received a letter from some members of the legislature regarding the 10th annual Iowa Governor’s conference on LGBTQ Youth held on April 3, 2015. A copy of the letter with signatures is attached for your review. The letter includes a thinly veiled demand to release information and implies potential retribution in the form of additional financial oversight of some of our sponsoring organizations. We find the letter to be an exercise in intimidation and totally inappropriate. The fact is, the information requested does not exist. Like most conferences held on small budgets funded solely by donors, we do not videotape our sessions. We have had repeated requests from Representative Greg Heartsill for information he has no right to expect will be provided him. These requests have become a distraction in doing our work to support students who are bullied. Instead of certain legislators using bullying tactics to force an organization to release information that does not exist, the Iowa legislature should step forward in passing SF 345 which sets forward real steps that can protect minor school children. While this bill has stalled in the legislature, schools continue to lack the necessary guidance and ability to respond to bullying. Families, students and educators are frustrated by the delay in acting on this important issue. Iowa Safe Schools is proud to stand with Governor Branstad in urging the Iowa House to take up this important bill and protect kids. If any members of the Iowa legislature are interested in next year’s Governors Conference on LGTQ youth and learn more about protecting Iowa’s youth, they are encouraged to register and attend. All our sessions are open for observation to those interested in learning how to create a more supportive environment for students who are often times put at risk. Iowa Safe Schools has denied the allegations in The Family Leader’s report, going so far as to launch a rebuttal campaign mocking its president and CEO, Bob Vander Plaats. It also became the source of ridicule from House Democrats during debate over the standing appropriations bill last Wednesday. CLICK HERE to see video of that debate (advance to 1:09:00 mark). Did faculty and/or staff from your district attend the conference? If so, how many? Did students from your district attend any of the workshops? If so, how many? Did your district cover the cost of the conference registration for faculty, staff, or students? If so, for how many attendees and what was the total amount spent? Did your district provide transportation If so, how many vehicles and at what cost?